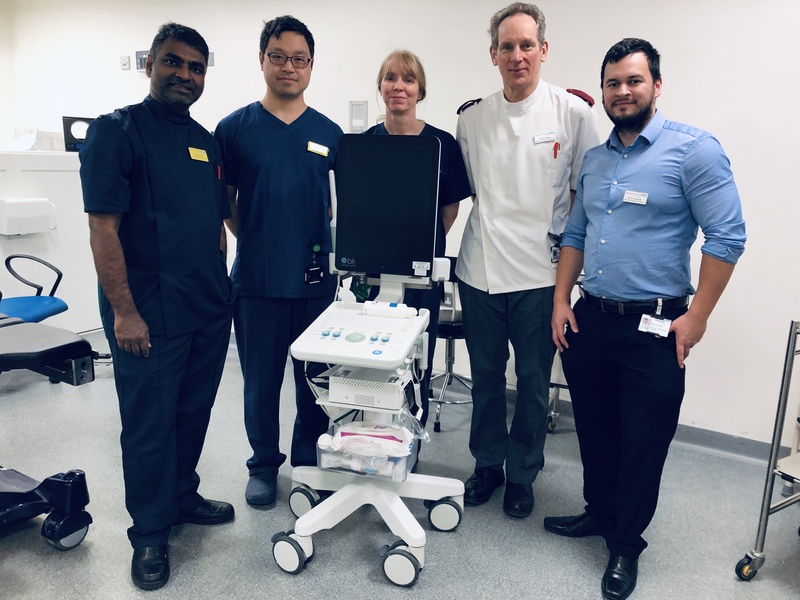 Maidstone and Tunbridge Wells NHS Trust (MTW) has begun using a ground-breaking procedure for patients with prostate cancer after a £355,000 donation from a local family funded innovative equipment. The Trust’s specialist Urology team treated its first patient at Maidstone Hospital earlier this year using tiny gold markers to more accurately deliver radiotherapy for prostate cancer. The Trust is the first in the UK to routinely offer this technique. The procedure allows surgeons to insert special gold markers known as ‘Fiducial markers’ inside the prostate, enabling radiotherapy to be focussed on the area and minimising radiation to the surrounding, healthy organs. The usual method in which the Fiducial markers are placed in position can possibly lead to a risk of infection, but MTW urologists have now developed a special technique of inserting the gold markers through the skin. The technique significantly reduces the risk of infection and has been shown to be safe in other studies around the world. The equipment to carry out the procedure was funded by Roy and Margaret Sutcliffe, from Maidstone, who gifted the money to MTW’s Kent Oncology Centre in August 2018, after Mr Sutcliffe was treated by the Trust for bladder cancer. Consultant Urological Surgeon at MTW, Mr Hide Yamamoto, said: “We are incredibly thankful to the Sutcliffe’s for their donation which has allowed us to lead the way with treatment in this field. “By using this equipment and the unique method of delivery we have developed, we can continue to provide world-class cancer treatment to our patients whilst greatly reducing the risk of infection. MTW sees approximately 900 new prostate cancer patients per year in the region, with the new method expected to benefit around a third of these patients. For more information on fundraising for the Trust, please contact Laura Kennedy, Fundraising Manager, at laura.kennedy8@nhs.net or call 01622 226428.